Rock Paper Lizard: Lewis's Woodpecker. I dare anyone to take a worse picture of a Lewis's Woodpecker. This was during a monster wind storm near sunset with pelting rain and lightning. Everyone else was running around, battening things down. 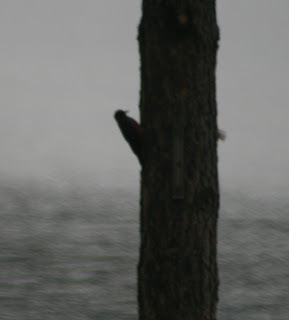 I was yelling, "Lewis's Woodpecker! Lewis's Woodpecker!" I'm jealous! That would be a lifer for me too. Rebecca:there's a whole bunch of easy lifers in the deserty parts of the continent. Go west! Neil: Those are fine examples. Excellent use of murk and noise, as if you shot through a pair of old jeans. Attention Houghton Mifflin! That's FABulous! =) I'd wanted to see one forever, and allegedly had years before (in crap lighting so I literally didn't remember it), then drove down an old road w/visiting (biology-enthusiast) friends and saw SEVERAL Lewis's in AMAzing lighting. Oh My Freakout. They are SO so stunning. Who knew? The picture I'd seen forever in my bird book did NOT do them justice. bb: There's nothing else like them. I hope to see one in amazing lighting some day. I think it was winter, we drove down White Rock Road between Mariposa and Le Grand in California. Tiny old road, great birding. Oh, and we got to the Merced National Wildlife Refuge at sunset--been there many times, NEVER at sunset. Sandhill cranes FLY IN en masse, so you see these mile-long lanky things floating silhouetted against a red-purple sky, and those throaty alto trills fill your head. Amazing. Neil and Hugh, do it! I'll be first in line to purchase your "crappy photo" field guide :D Now off to find what a Lewis's looks like without the rain and lightning. ps - Erg, if the CPFG doesn't work out, you could always contribute to google blogger's CAPTCHAs.